Did Trump's 'selling security to rich countries' policy cause Gulf crisis? 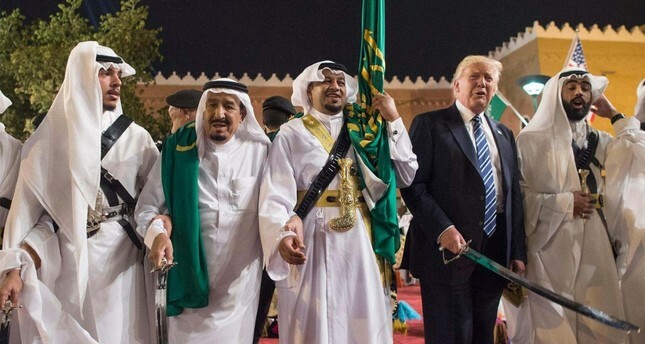 President Donald Trump (2nd R) with Saudi Arabia's King Salman bin Abdulaziz (2nd L) during a welcome ceremony with traditional sword dancers at the Murabba Palace in Riyadh, Saudi Arabia on May 20. COLUMNS What is Turkey's position in the global turmoil? The Qatar crisis has been at the center stage of global politics for the past two weeks. The crisis began with Saudi Arabia, the United Arab Emirates, Egypt and Bahrain taking aim at Qatar and implementing harsh embargoes and a policy of isolation against it. The loaded accusations directed at Qatar, while surprising to those who follow Gulf politics, did not change the results. Qatar was left to face heavy sanctions for two weeks. These accusations stated that Qatar was supporting Iran's regional expansionism, several terror organizations, and that it was manipulating the domestic affairs of regional countries. In order to concretize these accusations, a "list of terrorists" that Qatar was supposedly supporting was released. The list is, in no uncertain terms, a scandalous one. Since many analyses have already been carried out on how surreal a list it is, I won't be going into it here. This is obviously not the first crisis that Gulf countries have experienced with Qatar. A previous crisis had occurred in 2014 and Gulf countries recalled their ambassadors. But this crisis was resolved before deepening, unlike the current one. This time around, it was a much more complicated process, and its beginning was extremely revealing. This crisis came just after U.S. President Donald Trump's visit to Saudi Arabia. Let me be clear right from the get-go, I am not implying that the American president caused the Qatar crisis. But I do think that Qatar not responding positively to Trump's expectation is a significant contributor as to why the regional countries have taken positions against Qatar. The Gulf countries saw an opportunity and took it. Donald Trump's foreign policy is one indexed on making a "success story." We can say that this "success story" has three dimensions: "Enlivening the stagnated American economy," "fighting against terrorism effectively" and "removing the problem of immigration." Trump's announcements and attitudes first gave the impression that he would be attempting this success story in the Pacific basin. But this did not happen. Trump was deadlocked in the Pacific area and could not find the opportunity to acquire a "success story" from there. Following this, Trump thought that he would be able to enliven the American economy through the entry of hot money and get the success story of fighting against terrorism to be able to sell to the American public from the Middle East. That is why the Middle East that had been on the back burner of American foreign policy for a while was brought back to the center and placed in focus. Secondly, it appears that Trump has temporarily suspended his promise to enliven the American economy and improve the American lower and middle class by challenging China. Trump had announced that in addition to balancing China in order to revive the American economy and bringing the American investors who had spread out around the world back home that he would put in place the formula of "selling security to rich countries." Trump emphasized Saudi Arabia and Gulf countries during his electoral campaign and after taking his position as president. And in fact, Trump conducted his first trip to Saudi Arabia. He signed an arms deal with Saudi Arabia and announced that he had brought in $10 billion as hot money to his country. In his visit to Saudi Arabia, Trump also had expectations from Qatar. For whatever reason, Qatar did not demonstrate the same positive attitude shown by Saudi Arabia. After this a crisis occurred and Trump supported the crisis by making statements implying that Qatar was the source of wrong policies. It is not correct to connect the Qatar crisis with just Trump being unable to realize his expectations from there. Countries such Bahrain, the UAE, and Egypt have the worry of restraining Qatar. The wave produced by the Arab Spring is still a cause for fear among regional countries. They also believe that through use of its soft power, with Al Jazeera TV foremost among them, Qatar played a role in the construction of serious turbulence in the region and that it needs to pay for this. The latest announcement from the Qatari defense ministry gives us a very clear idea. The Qatari Department of Defense announced that it had signed a deal with the U.S. to purchase $12 billion worth F-15 planes. According to the news from Qatar's official news agency QNA, the deal is such that it will allow employment for 60 thousand people in 42 states in the U.S.! I have nothing more to say.